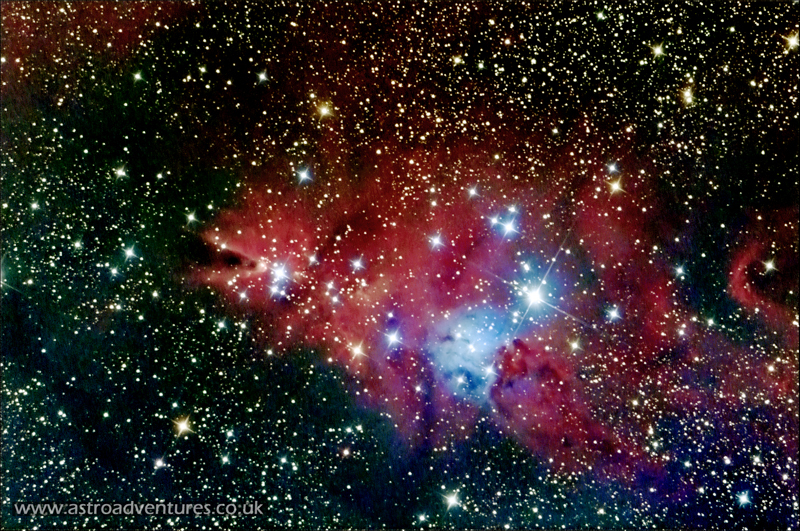 AstroAdventures, established in 2005, is situated in glorious North Devon, right on the Devon & Cornwall border. Within easy reach of coastal resorts such as Bude this is a marvellous holiday destination. We offer you the chance to combine your holiday with astronomy. 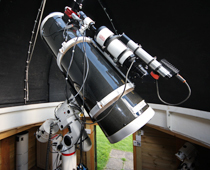 To cater for your interests in astronomy we have a large 20" (50cm) Dobsonian telescope and a dedicated imaging observatory with a 10" (25cm) telescope for you to use under some of the darkest skies in England. Experience the wonders of the night sky. The Milky Way, galaxies, nebulae and the planets. With unobstructed southern horizons and the absence of light pollution and all can be seen at their best. 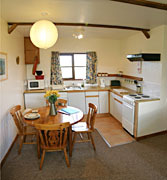 Enjoy comfortable and private self catering family accommodation in a peaceful rural location. 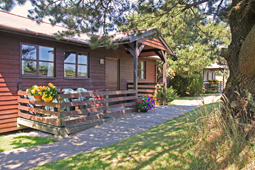 We have two timber lodges set in attractive grounds with an outdoor swimming pool. The swimming pool is open from mid June through to the 1st week in September. 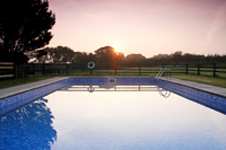 Our pool is heated by an air source heat pump during July and August. The Devon countryside with its beautiful beaches & national parks plus local attractions, such as the Tamar Lakes, are easily accessible. This area known as Ruby Country is ideal for family holidays. 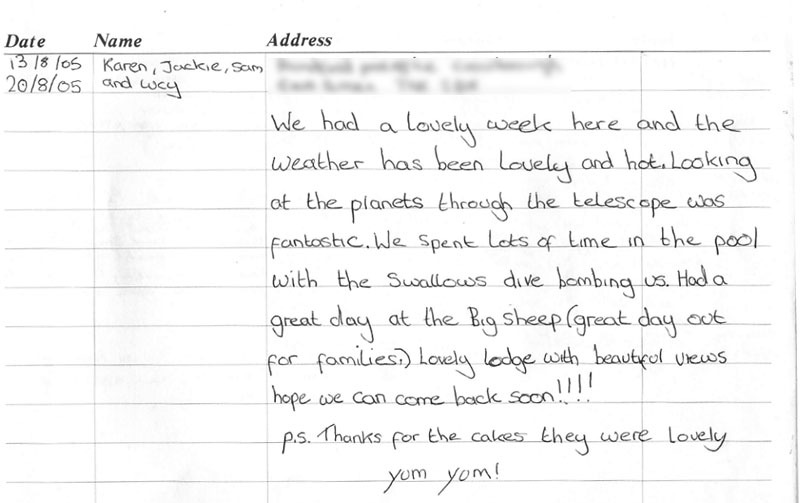 We are also a great venue for out of season short breaks. 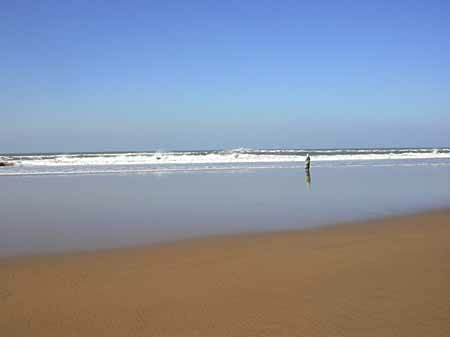 The nearest beach is Sandymouth which is only 7.5 miles away! See this map for our location. Please visit & like our facebook page where we post our most recent pictures & activity. AstroAdventures are Murray and Valerie Barber with Tony Gibbons. This Site is designed and maintained by Tony Gibbons. Our site is located in one of the darkest areas of England. This data was collected by the Campaign for Dark Skies who rate this area with a visual limiting magnitude of 5.75 - 6.00. Click here to see an excerpt from the 'Philips Dark Skies Map' that clearly show the outstanding skies this area offers. Both the run off roof and the domed observatory provide valuable shelter from the elements and your lodge is only a moment away for that all important coffee and warmth! We will show you how to use the telescope(s) so that you will be able to observe without someone looking over your shoulder the whole time. If you don't feel confident then we would be pleased to assist until you do. This all contributes to a unique and enjoyable observing experience. We really enjoy visual astronomy, but as you'll see from our gallery we have experience in most types of imaging and image processing. We will be more than happy to help or advise. 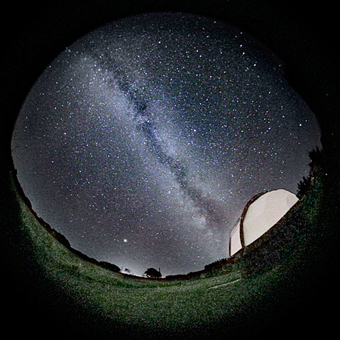 A tour of the observatories on your arrival. 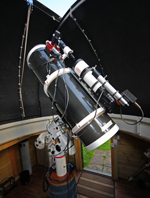 You will be given a free introductory night session of one hour on the half meter Dobsonian. This is done with a view to you being self sufficient with its use. Once competence is established and mutually agreed you may use the telescope whenever you wish. There are no extra charges for guests who are then able to use the telescope unaccompanied. 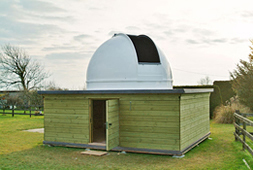 The following observatories and equipment are available for guests to use. NB. You may have to share a facility with another guest. 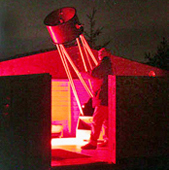 Unrestricted mobility is required to use the telescopes and observatories. 20" (half metre) f5.3 Dobsonian Reflector. 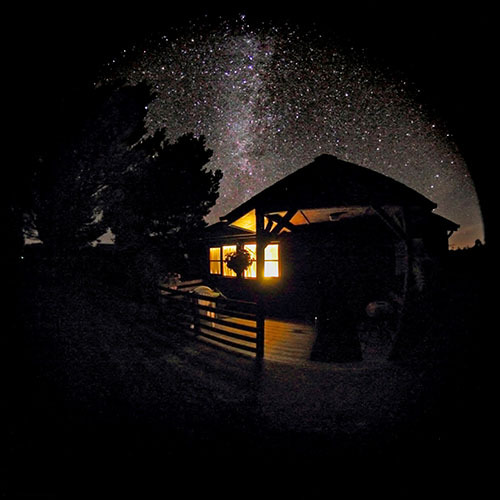 The half meter telescope is housed in a large run off roof observatory which provides the perfect environment for visual observation of the night sky. It is equipped with an 'NGC Max' object locating computer, Telrad finder and a 2" JMI NGF focuser. This telescope is the ultimate for visual deep sky observing. The use of step ladders is required. Now with HiLux coatings this telescope has the same light gathering capacity as a normally aluminised 22" telescope! The Quattro is housed in a 2.7 meter Pulsar dome which has mains power, work benches, and lighting. This creates a superb environment from which to carry out all kinds of imaging. Equipped with a MoonLite motorised focuser, a DSLR or CCD can be comfortably mounted and focused. This is a great telescope for deep sky or planetary imaging. A 'goto' mount, fast f4 optics with a large light grasp and high contrast coupled with the renowned Baader Coma correcter make this a technically excellent and enjoyable telescope. Please note. Because of the complex nature of this telescope it will only be possible to use it or image with it unaccompanied if you have prior experience with similar equipment. If you have no prior experience please see our optional tuition and the Imaging section below. A QHY5L-II-M mono camera and an 80m 'shortie' refractor which is mounted on the EQ6 and used in conjuntion with PHD software as an autoguider. A Canon dslr for deep sky imaging. The Canon can be controlled via 'APT' software. For the moon and planets an Imaging Source DFK 21AU04.AS colour camera is available. We have a dedicated tower PC with the required software loaded and configured for use with all the above hardware plus the cables and adaptors needed. Please note. Prior familiarity is necessary and we do make a charge for the use of the Canon. If you have no prior experience with imaging then you can use this equipment through our optional tuition. Should you prefer to bring your own telescope. There is an area of level, paved hard standing picture. The hard standing is close to our dome and mains power can be run from there. Or if you prefer you can set up on grass in our paddock area. There are two lodges for let, Jay and Wren. Both are very similar in decor and equipment. Both lodges will comfortably accommodate and sleep a family of 4. Bathrooms have a shower, bath, wash basin and toilet. (Jay lodge has a 3/4 bath) There is also an airing cupboard and cloths airer. Towels are not supplied. Apart from the bathroom and bedrooms the rest of the lodge is open plan. The living area in both lodges has two double sofas. In both Jay and Wren one of the sofas is a fold out sofa bed. The kitchen-dinning area contains a combined washer-dryer machine, a cooker with halogen hob, a fridge, and a microwave. The kitchen is fully equipped. Each lodge also has an iron, ironing board and a hairdryer. 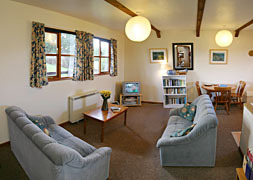 Both lodges have a 30"flatscreen TVs with Digital Freeview and a DVD player which can also play audio CDs. Free WiFi in both lodges. We have slow rural broadband so unfortunately it is not possible to stream movies etc. Electric heating consisting of economy 7 night storage in the main room, flat panel electric heaters in the bedrooms and additional electric heaters are provided for use in the chillier seasons. Hot water is supplied by an economy 7 electric immersion heater. Electricity is supplied via a coin meter which takes £2 coins. We only charge you what it cost us. Pets are welcome but please see our policy on pets here. There is a strictly No Smoking policy in the lodges but feel free outdoors. We aim to provide a relaxing retreat from everyday pressures. There is a large paddock, with a swing set, for children to play in. There is plenty of room even for football and cricket! There is a large wild flower meadow which has a path mowed around its perimeter. More health concious guests have used this as a jogging track. We have barbecues that you can use. We have barbecues that you can use. During the summer season enjoy the outdoor swimming pool for laid-back days on site. The swimming pool is open from June through to the 1st week in September. As of 2016 our pool is heated by an air source heat pump during July and August and if you've been before you should be warmer than in previous years! Please note - The pool is unsupervised. The price for each week is shown within the grid. The price also indicates Saturdays, which are the start of our week. Days marked with an indicate that one of our two lodges is booked and that one lodge is vacant. Days marked with an or bold text indicate that both of our lodges are booked and we have no vacancies. Please see the bottom of this page for information on bringing pets, other additional charges and short breaks. Bookings run from 4pm Saturday to 10am the following Saturday. 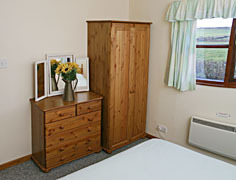 Prices shown are based on a double bed plus bunk beds in Jay and a double bed and 2 singles in Wren. Electricity. This is supplied by a coin meter which accepts £2 coins. We make no profit from this, you are charged the same rate that we pay. 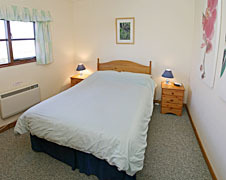 Our lowest tariff is based on a maximum of three adults in one lodge. Any additional adults over this will be an extra £50 weekly per adult. Pets. There is a £25 per week charge for each pet. Please click here to see terms and conditions regarding pets. Periods of New Moon. We regret that due to high demand the minimum stay for any week that encompasses a new Moon is now 2 nights. Scroll down to see our Moon phase calendar. A 1/3rd deposit is required within 7 days of booking. The balance will be due 1 month before your holiday start date. Payment is by cheque or bank transfer only. We are unable to accept credit or debit cards at this time. A two night stay is 50% of the weekly rate, three nights are 65%, four nights are 75% and five nights are 90%. We can take bookings at very short notice. Please contact us for availability. 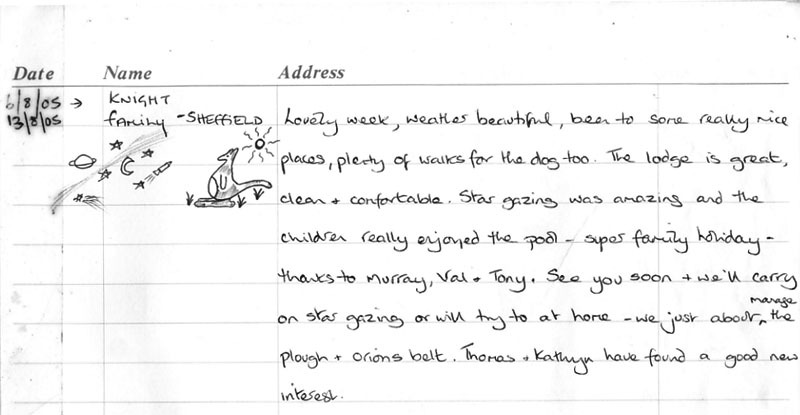 Short breaks are available from Mid September to Mid June, availability permitting*. Although these calendars are updated frequently they are for information only. Please email us to confirm availability and to book your holiday. Please click on the links below to go to seperate areas of our site and view some great images. Each link opens in a new tab. We post our most recent pictures & activity on So please give our facebook page a visit and like! Deep Sky images taken by us. Solar System images taken by us. Images taken with a Meade DSI. Pictures taken by guests during their stay. Some of our past telescopes. M1 in Taurus. Taken by Tony @ AstroAdventures. QHY8L. Skywatcher Quattro CF 25cm. NGC7331 in Andromeda. Taken by Tony @ AstroAdventures. QHY8. Skywatcher Quattro CF 25cm. The Christmas Treee nebula. Taken by Tony @ AstroAdventures. QHY8. Skywatcher Quattro CF 25cm. 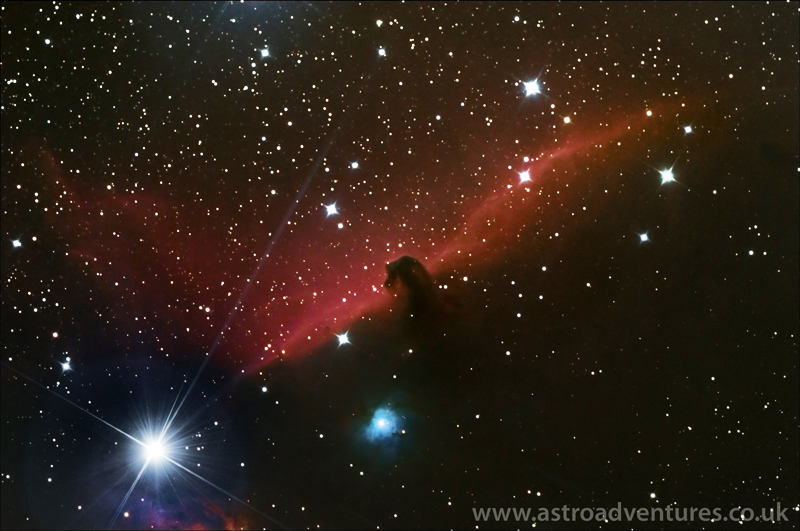 Horse Head Nebula in Orion. Taken by Tony @ AstroAdventures. QHY8. Skywatcher Quattro CF 25cm. 3 hours of luminance and one hour each of red, blue & green. 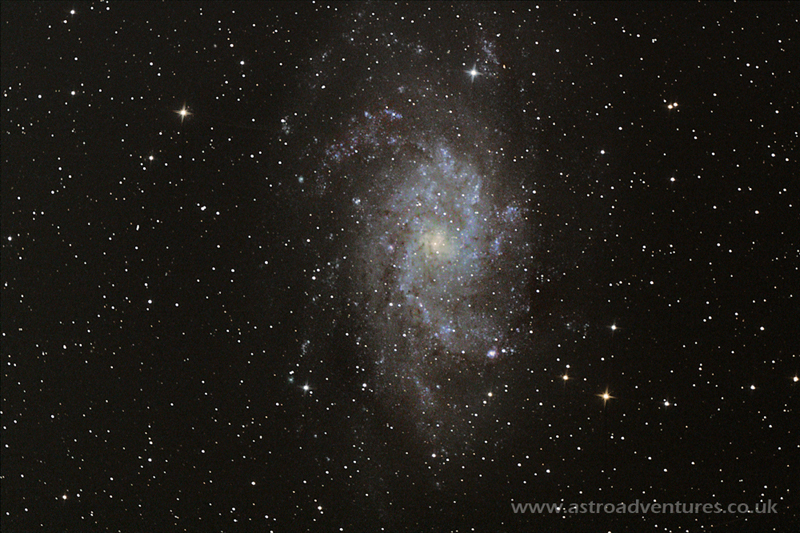 M33 in Triangulum. Taken by Max Maltz. Skywatcher Quattro CF 25cm. 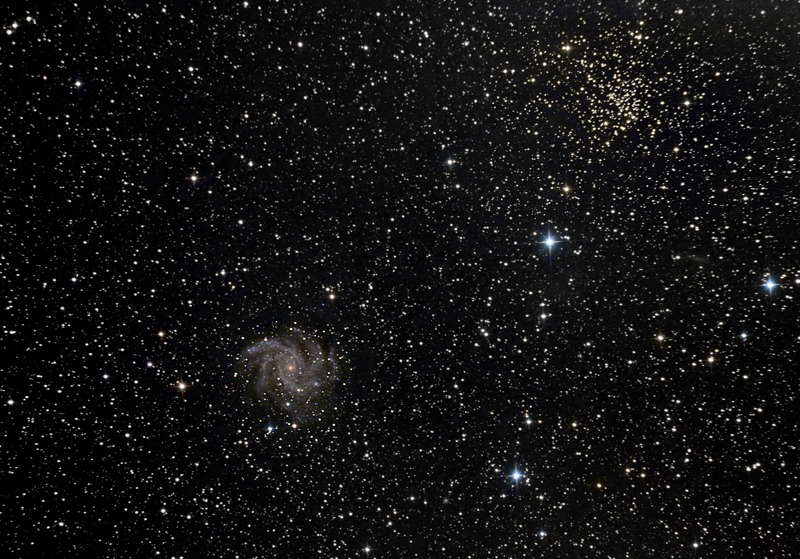 Galaxy ngc6496 and open cluster ngc6939. Taken by Tony @ AstroAdventures. Skywatcher Quattro CF 25cm. 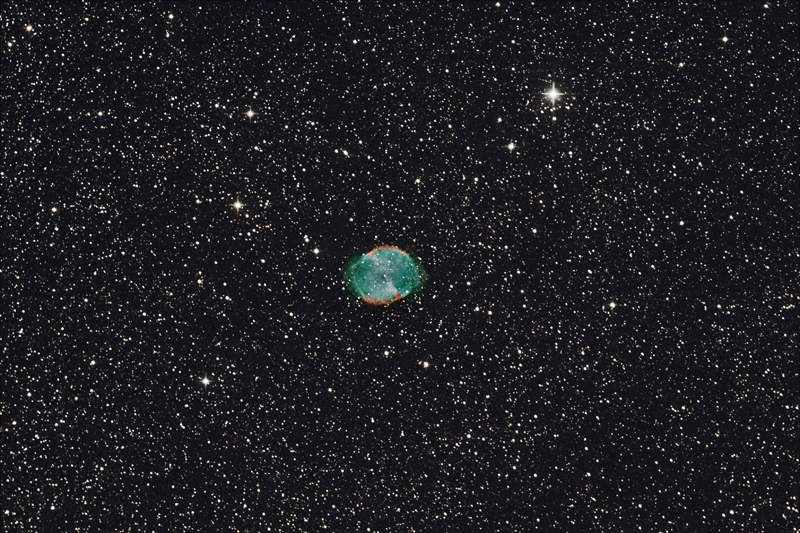 M27 - The Dumbbell nebula in Vulpecula. Taken by Tony @ AstroAdventures. QHY8. Skywatcher Quattro CF 25cm. 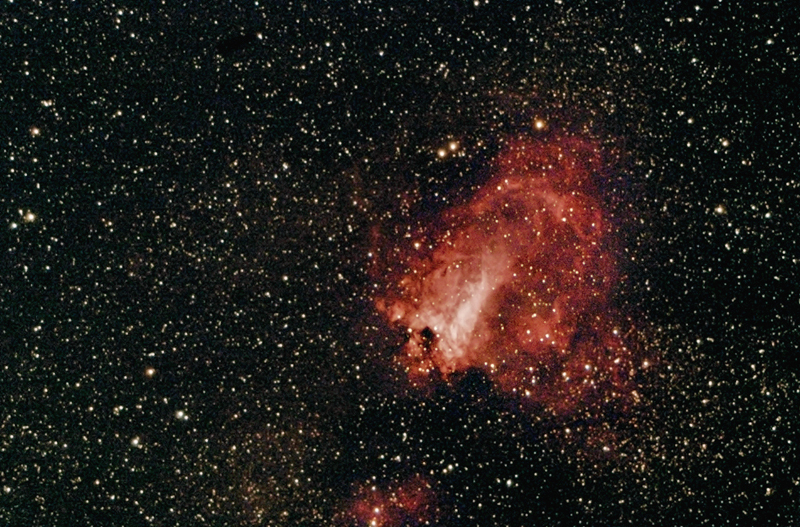 M17 - The Swan nebula in Sagittarius. Intes MN71. Taken by Gareth Rees. AstroAdventures was created in 2005 by lovers of astronomy for the benefit of enthusiasts of all levels. 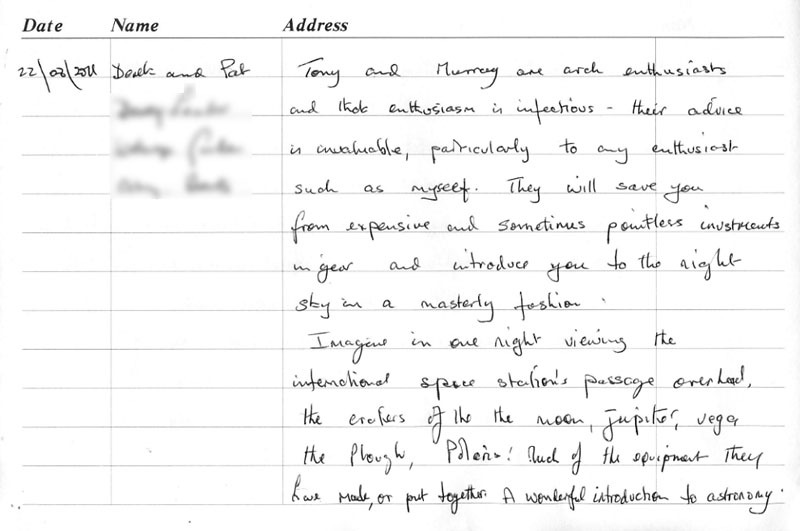 It has its roots in Murray, Valerie and Tony combining family holidays with their love of astronomy. Holidays became quests for ever darker skies and children and provisions were crammed into cars around ever larger telescopes. Nowhere was ever perfect and no one understood our requirements. Surely someone must cater for our needs?....and so the idea was born. Years passed and plans were laid. Eventually in 2004 a holiday in Devon became a property hunt and Kimworthy cottage was found. Old lives were cast adrift and the AstroAdventure began. We love it. We hope you will enjoy it too. Here are short biographies of our two resident astronomers. Murray was given his first telescope when he was seven years old and after progressing onto to a 60 mm refractor in his pre-teens he was to meet like-minded Tony at senior school. The cost of telescopes led to Murray (and Tony) to grinding and polishing his first and only telescope mirror when he was 13. This mirror was then replaced by a Fullerscope 10” mirror in his late teens and this led to the building of his first of many ‘back-yard’ observatories. Although he has taken many astronomical photographs his interest is visual astronomy concentrating mainly upon the Deep Sky. In addition to astronomy, he is also interested in space travel and military history. His first book, Hitler’s Rocket Soldiers was published in 2011 by Tattered Flag Publishing. He has operated a mobile planetarium for over twenty years and has given thousands of talks to children and adults on astronomy and related subjects – ‘Ancient Egypt and the Stars’ being a particular personal favorite. He has written educational curriculum support information that is used internationally with planetariums. 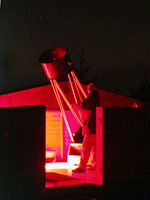 He has been a member of various astronomy associations and enjoyed a 6 year tenure as Chairperson for the Wadhurst A.S. He has been a fellow of the Royal Astronomical Society for over 20 years. Tony became interested in astronomy in his early teens. Looking back he feels that growing up through the era of the 'space race' and Apollo missions it was inevitable that an enquiring mind would do so. His first proper telescope was a four inch reflector loaned to him by the physics teacher at his school. With an adolescents disregard for others property the telescope was promptly taken apart, rebuilt and improved. This process occurred many times and set the precedent for future telescope related activities! Alongside this ran an avid interest in photography and many old film box cameras were butchered and attached to telescopes with tape, glue and faith in the hope of capturing the objects fleetingly seen through the eyepiece. Years spent in the photographic and printing industries became a foundation for the understanding of capturing images and processing the results, first on film and later with CCDs. He cut his teeth on Photoshop 2.5 which came on 3.5" floppy discs! He was treasurer of the Ilkeston and District A.S. for many years. There is an underlying love of the night sky and collecting photons from the universe with electronics or the biological camera of the eye that ensures his continued and fresh interest to this day. Please use the form below to contact us by email. Thanks! We like to take bookings or booking enquiries by email as it gives us time to check all the details for you. 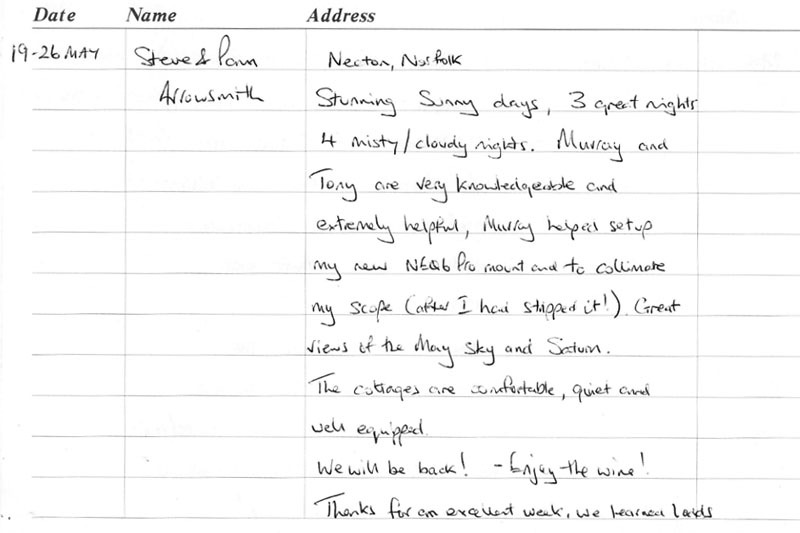 We are more than happy to chat about your visit over the phone once your booking has been made. We endeavor to respond to all enquiries the same day. However we are not online 24/7. Depending on the time of day you contact us it may be up to 24 hours before we are able to reply. Thanks for your patience. A real departure for us! - Pottery Courses - Throwing & Firing. Raku. - click here - Contact us if you'd like more information. What's our weather doing? - check out the (nearly) real time report from our own weather station. 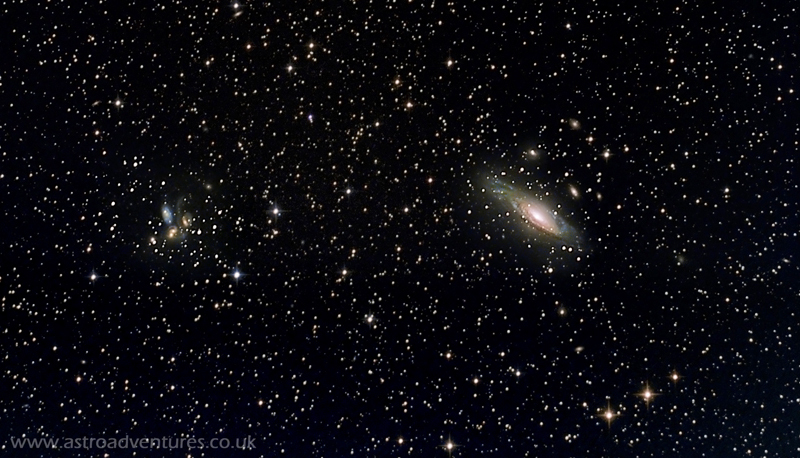 A selection of Links to enhance your Holiday plus some useful Astronomy Links. Heavens Above - Comprehensive satellite information plus comets and asteroids. Spaceweather.com - News and information about the Earth-Sun environment. 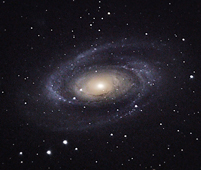 The Society for Popular Astronomy - An excellent on-line Astronomy Society. 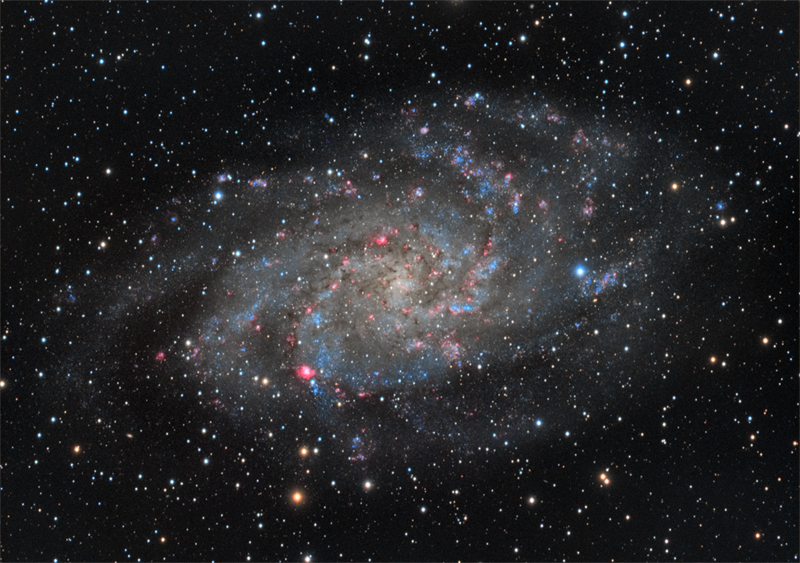 Skyhound - a source of timely information for the observer - Great monthly observing notes. Virtual Moon Atlas - Excellent Lunar Map - Free software for Moon observation or survey. ccdland.com - Nik Szymanek's excellent Astronomy Web Site. Many from the ING on La Palma. 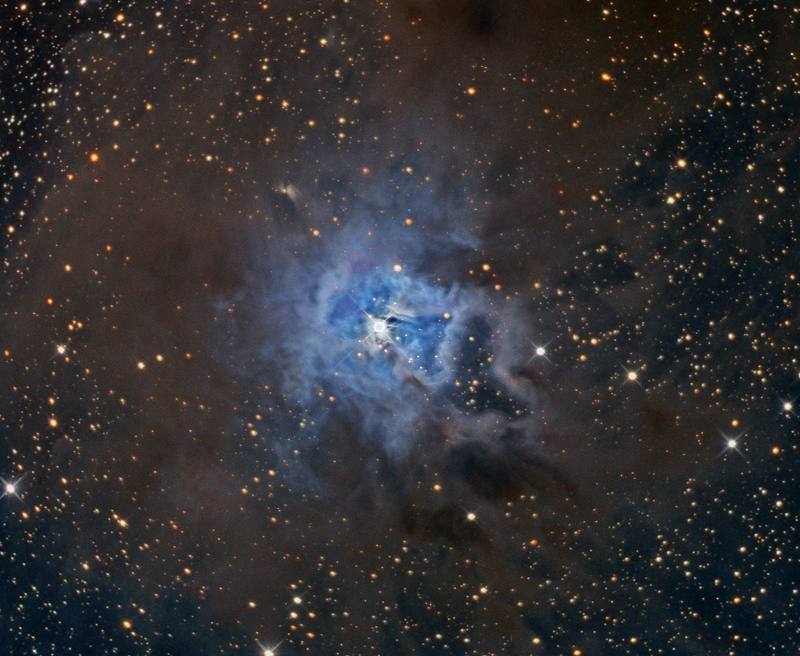 Ian King Imaging - Ian King imaging is an online shop dedicated to astro imaging and the supply of high quality CCD Cameras, telescopes, accessories and mountings. Also a gallery of his own work. 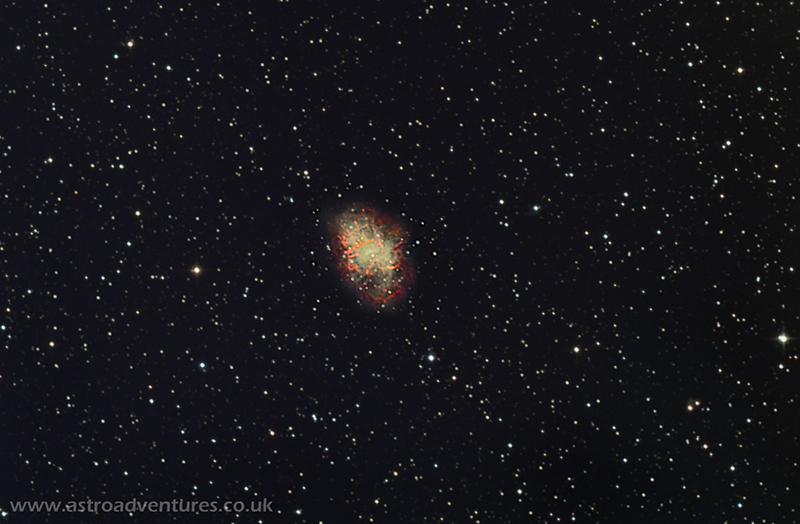 Deep Sky Stacker - Another great piece of freeware. FAS - The FAS is a union of astronomical societies for encouragement and promotion of astronomy. 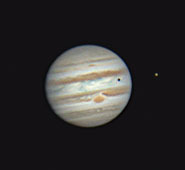 Registax - This is the program that has revolutionised amateur planetary imaging and it's free! SOHO - The ESA NASA Solar Observatory with up to date solar images. Astronomy Picture of the Day - Nasa site featuring a new astronomy picture each day. 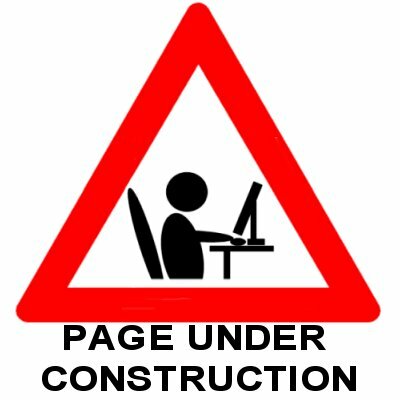 Friend's sites and other sites we like. Worthy Pottery - We offer pottery tuition. Ask for details. Spacelab Mobile Planetarium - Planetarium Visiting Service. Liz Allen Art - Take a look! FullDome Reality - Digital Mobile Planetarium and Immersive Cinema. Richard Bizely Art - Astronomy inspired art & more. Kimworthy Cottage - Holiday in the Devon Countryside.